The Gem Project, Inc. - We Captivate To Educate > Team Journal > Enrichment Articles: Healthy Eats > Hello! From: Alnissa Craig of Cooking with Besos, brings healthy eats! Hello there! Welcome the first installment of , “Healthy Eats with Cooking with Besos!” That sentence may come off a little crazy so let me give it some context. I’m Alnissa and I have a food blog called “Cooking with Besos,” I share recipes that are easy to do, but in case they are not easy enough I give step by step photos to help you along. Now, I’m working with The Gem Project to provide tips and recipes that are not only easy– but also healthy. Glad that’s all cleared up. Now, making the choice to eat healthier is an important one because the food we eat is the fuel to our bodies. If want to take the best care of ourselves, we should supply our bodies with the best quality fuel. Unfortunately many of us are supplying our bodies with, sorry to say, junk and highly processed foods rather than high quality fuel like whole grains, leafy greens, and lean proteins. Why do we do this? Well, I’m sure there are many reasons we choose not to eat better, two of which are probably convenience (it’s so easy to turn into that fast food drive-thru or pick up a boxed dinner solution) and the misconception that healthy food equals bland or tasteless food. This may cause some to look at eating well like a chore or even a punishment. I want to show you that it is easy to cook healthy foods and that healthy foods can be delicious! It’s not easy to just all of a sudden completely change your diet, but you can start on a path of better eating by making small changes. A great way to make changes and take charge of the food that goes into your body is by getting in the kitchen and cooking for yourself. I get such a wonderful sense of satisfaction when I buy ingredients, cook them, and enjoy the finished product. I want to share that with you. and get good nutrition at the same time, but best of all it tastes really good which is really the most important part isn’t it? 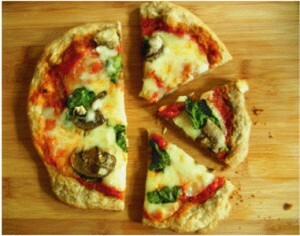 Weekly Newsletter: Week: April 16 - April 22, 2012 - Special Edition: Community is family Cooking with Besos:Healthy Eats – Pizza! !